The U.S. Consumer Product Safety Commission in cooperation with Meijer Inc., of Grand Rapids, Mich. , have recalled about 17,400 Bumble Bee and Lady Bug Infant Slipper Socks.The balls at the end of the bug’s antennae can detach, posing a choking hazard to young children. This recall involves Falls Creek brand infant slipper socks, including yellow and black Bumble Bee Slipper Socks, UPC 80640907401, and red and black Lady Bug Slipper Socks, UPC 80640907402. The UPC is located on the sock’s hangtag. They were sold in infant size 0-12 months. The Bumble Bee and Lady Bug Infant Slipper Socks were sold at Meijer stores in Illinois, Indiana, Kentucky, Michigan and Ohio from June 2009 through March 2011 for about $4. 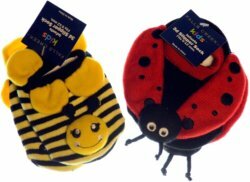 The Bumble Bee and Lady Bug Infant Slipper Socks were manufactured in China.